The proximity notice requirement comes in partial response to the various nuisance lawsuits and jury verdicts (and multi-million dollar damage awards) against Murphy-Brown (Smithfield Foods) related to swine operations. The purpose of the now-mandatory notice is presumably to deflate nuisance claims by purchasers of land or residences within a certain distance of the farm operation, this under a legal theory called “coming to the nuisance.” Under this theory – as yet untested before the North Carolina Court of Appeals or Supreme Court – a person with knowledge beforehand of a potential nuisance may not fully claim damage for such nuisance. The proximity requirement comes as an adjunct to North Carolina’s Right to Farm law (N.C.G.S. § 106-701), which was also modified by the Farm Act of 2018 to reduce a farm neighbor’s ability to succeed in a nuisance action against a neighboring farm. At the GIS Conference, Branan reviewed the background and historical changes to the VAD Statute and the growth of VAD ordinances to (at last count) ninety (of 100) counties according to the North Carolina Department of Agriculture and Consumer Services. He also reviewed the various proximity buffer requirements, and examples of how counties are working to comply with the directive of the statute, which basically requires counties to demonstrate – with their digital land records system – the location of farm tracts in VADs with what amounts to a notice buffer. Branan noted that the key term is “qualifying farm,” which is defined by the VAD ordinance enabling statute as a tract engaged in agriculture (as defined under N.C.G.S. §106-581.1) and that has signed a ten (10) year revocable agreement not to convert the land to non-farm use. 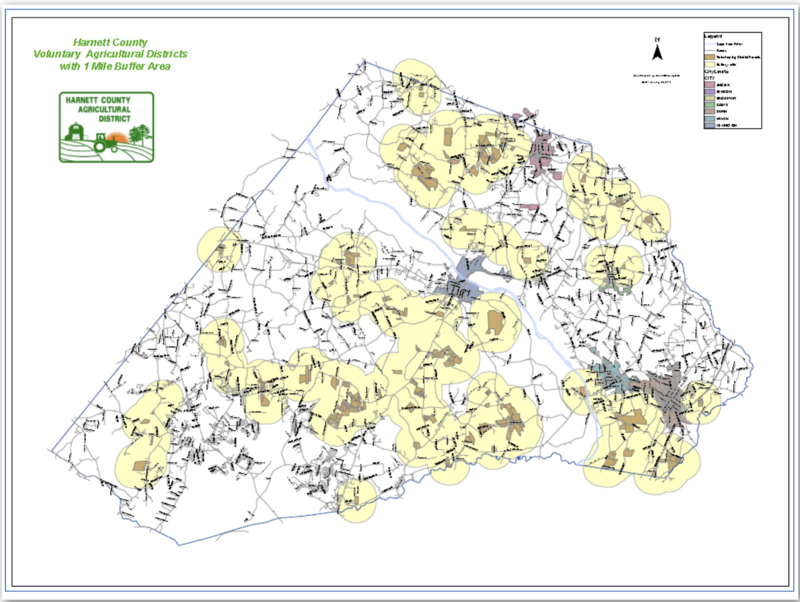 While some counties have taken the step to identify tracts in VADs with a GIS layer (see Harnett County illustration), Orange County has taken the step of incorporating proximity notice to appear in chain of title for tracts within the buffer vicinity of a qualifying farm, but not themselves in a VAD or a qualifying farm. While counties – on observation from the conference – have so far have assumed that this proximity notice responsibility falls upon the county GIS department, Branan suggested that the language of the statute may actually place this responsibility on the county Register of Deeds – as Orange County has chosen – given that the statute specifically requires counties with digitized land records “include some form of notice reasonably calculated to alert a person researching the title of a particular tract that such tract is located” near a VAD farm. While a county’s GIS portal has many uses, it does not demonstrate chain of title or form the basis of a title opinion on a tract of land. Branan noted that state enforcement responsibility for the proximity notice is not specifically known, neither are the ramifications for non-compliance. Members of the audience seemed to agree that the statute as written offers some vagaries on exactly how to implement the proximity requirement. In addition to the GIS vs. Register of Deeds issue already noted, the actual designation of what constitutes a “Voluntary Agricultural District” – which requires the 2640 feet foot buffer proximity demonstration – can vary from county to county, and a VAD can conceivably include land not enrolled. Further, the proximity buffer required for qualifying “swine, poultry, and dairy” farms – though this description does not describe whether such operations employ confined or open livestock and poultry systems, nor does the term describe their intensity (i.e., number of animals). (Depending on how such VADs are defined by ordinance, the “600-foot” buffer requirements may be somewhat redundant, with the 2640 buffer as the default). Branan noted that it would seem that, since the 10 year conservation agreement is the critical piece of identifying a “qualifying farm” under any Voluntary Agricultural District ordinance, simply requiring a one-half mile buffer notice from any qualifying farm would bring such notice in sync with the Right to Farm laws one-half mile limitation on standing to bring a nuisance action against a farm operation.